Ever have one of those nights that you can't sleep, so you lay awake looking at the clock and playing the 'how many hours of sleep will I get if I fall asleep right now' game? 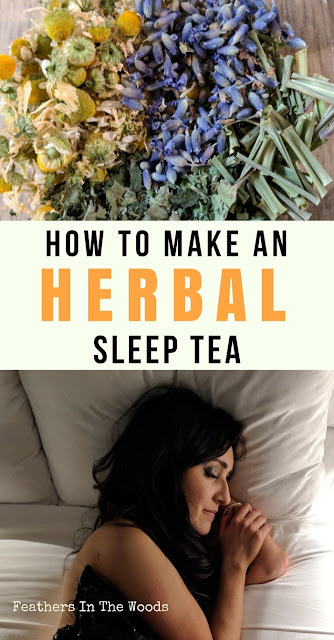 I have that problem from time to time and years ago I turned to herbal teas to help me sleep. 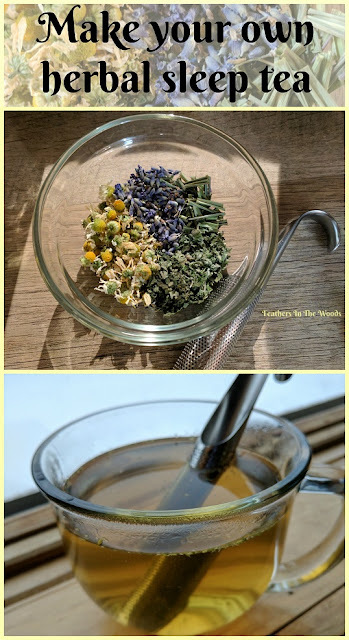 There are a few teas that I really like and have used for years before I started growing my own herbs. Growing my own herbs was a total game changer! Herbs from my own garden were fresher, cheaper and I had more of a variety to choose from. I grow about 30 herbs each year and probably a dozen or so have made it into my sleep blends from time to time. Though I do like to change it up a little, I usually come back to the same blend. In honor of January being National Hot Tea month...I'll let you in on my secret! I combine all this in a small glass jar. Shake jar gently to mix and use about a tablespoon per cup. (recipe makes about 3 servings) I like to boil water in a kettle not the microwave. While the water is heating up I fill my tea infuser with the tea blend. I crush the herb blend between my finger as I'm adding it to the infuser to release the flavor and essential oils. I use this sleek tea infuser because it has very small holes so very few herb pieces get through. As soon as the water starts to boil pull it off the heat. Pour into your cup and add your infuser. Cover and let steep about 5-10 minutes. Covering the tea as it steeps is important so the steam doesn't escape. You don't want the essential oils that are in the herbs to evaporate away with the steam, so keep it covered until it's done steeping. Once the time is up just pull out your infuser and you're ready to go. you can add a little honey if you like it sweeter, I usually just drink it plain. This tea tends to have a bit of a floral taste from the lavender so if you don't care for that just skip the lavender. If it doesn't seem to help you very much after a few days you could add some valerian root. Only add a teaspoon of valerian to the whole mixture but steep 10-15 minutes instead. I happen to grow my own herbs but if you don't you can order them online or find them in grocery stores. I prefer to buy them from health food stores though and if possible I always choose organic. If all you have is the grocery store for herbal teas, my old standby is Celestial Seasonings Lemon Jasmine Sleepytime tea. I like to carry this one with me when I travel since I sometimes have trouble falling asleep in a hotel. The course is free but you can choose to buy a workbook if you'd like to have something special for your notes. I've joined the class and I hope you will too....How can you say no to free? I like the herb combination. I will deffinitly try this tea! I need to drink more teas. Trying to get away from soft drinks. Thanks for sharing! I know how you feel about the soft drinks! They are so hard to resist! I love sleepy time tea too. Thanks for the recipe I may need to make my own! Thanks for linking up at #MerryMonday! I used to drink a lot more herbal tea. Our kettle went unused for so long that now I don't really drink tea anymore, but this makes me want to start up again. Thanks for sharing what sounds like a delicious recipe! Lemon Balm is as bad as mint when it comes to taking over the garden! I had to plant mine both in sunken pots this year to keep them contained. Enjoy your tea! I need to keep this. It will come in handy. Pinned for later. Thanks for sharing at #OverTheMoon! Thank you & please link up your most recent posts!